The Journal, Webster University’s student newspaper, won 28 awards at the 2017-18 Missouri College Media Association conference, including Best in State and several individual awards for news and sports writing, news reporting, photography, video, multimedia, cartooning, design and more. The newspaper received Best Overall Newspaper (all divisions) as well as 1st Place Sweepstakes (Division 2), presented for the most points accumulated based on the number and rank of awards won. 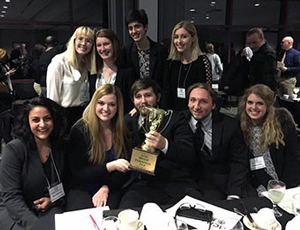 Overall, The Journal received three overall 1st-place awards, 10 individual 1st-place awards for individual categories, eight individual 2nd-place awards, four individual 3rd-place awards, and three honorable mentions. “This speaks volumes to the quality of our students, faculty, and their work together,” said Eric Rothenbuhler, dean of the School of Communications. Read more reactions and details about the individual categories and award recipients in this story on the School of Communications page. Visit the publication online at websterjournal.com.